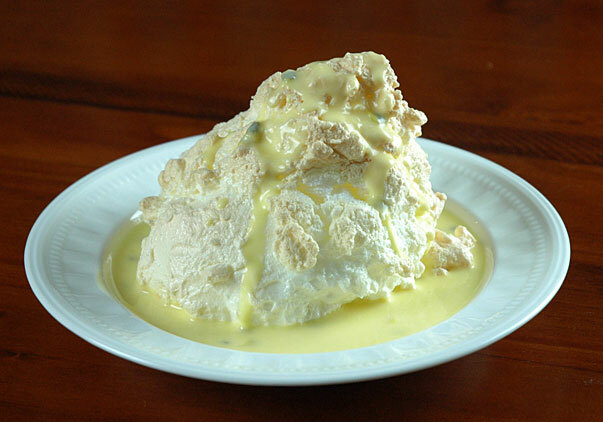 Every time I think of Paris I am reminded of my favorite dessert, Ile Flottante or floating island. Light flufy meringue swimming in an ocean of soft custard. In a mixing bowl and a balloon whisk, beat the egg whites with a pinch of sugar and the cream of tartar. When the eggs being to form soft peaks, continue beating and slowly add the sugar. When the sugar is dissolved and the mixture has firm, shiny peaks, it's time to bake. Either drop by large spoonsful or pipe islands on a silpat or baking paper. Bake at 150C for 30 minutes until the meringue is set. Serve in a bowl of creme anglaise or pouring custard.